JPMorgan CEO Jamie Dimon has a much-vaunted track record of promoting women to senior roles on his executive team. But the number of women on the U.S. bank's board of directors has stalled out at two since 2006, despite research showing greater female representation improves long-term returns. JPMorgan Chase & Co. (JPM Chairman and CEO Jamie Dimon professes himself a feminist. But when it comes to gender diversity, his board of directors increasingly lags woefully behind those of rival Wall Street firms. Goldman Sachs Group Inc. (GS and Morgan Stanley (MS recently added female directors to their boards, lifting the number of women to the threshold of three that some corporate-governance experts consider a critical mass. The percentage of female directors is 25% at Goldman and 31% at Morgan Stanley. Yet at JPMorgan, the number of female directors has stalled out at two since 2006, representing just 17% of the 12-member board. That level ranks the bank in the bottom fourth of the Standard & Poor's 500 Index of large U.S. companies, according to BoardEx, a relationship-mapping service of TheStreet Inc. The gender gap looks even more glaring when other big U.S. banks are included in the comparison. Wells Fargo & Co. (WFC , which had a male-dominated board prior to a series of corporate scandals starting in 2016, has since shaken up its top echelon, installing a female chair and increasing the number of women to five, and the percentage to 42%. Bank of America Corp. (BAC and Citigroup Inc. (C also have five female directors. Dimon's failure to add more women to New York-based JPMorgan's board has drawn criticism from some shareholder advocates, especially given the largest U.S. bank's role at the epicenter of global finance, and as a symbol of modern American capitalism. A growing body of research has shown that boards with more women are better at decision-making and bring higher long-term financial returns, while some studies suggest that female directors are less likely to be taken seriously without a critical mass of at least three. And some experts say that women are more assertive in the boardroom than men and thus more likely to challenge CEOs on crucial topics, such as risk-taking. That's especially important for a big bank like JPMorgan, whose primary business is taking risk -- on such activities as loans, derivatives trading and investment-banking deals. "Having a less inclusive board has a lot of undesirable effects on the governance of the firm," said Darren Rosenblum, a law professor at Pace University in New York who has written research papers about diversity on corporate boards. "Chase is far from the riskiest bank, but it's in a risky industry, especially so now with all the uncertainty in the world." To Dimon's credit, JPMorgan's stock price has nearly tripled over the past decade, beating not just rival banks but the S&P 500. Yet corporate-governance experts say that greater gender diversity at the very top of companies improves long-term shareholder returns, suggesting that JPMorgan's investors could have fared even better had Dimon added more women to its board. 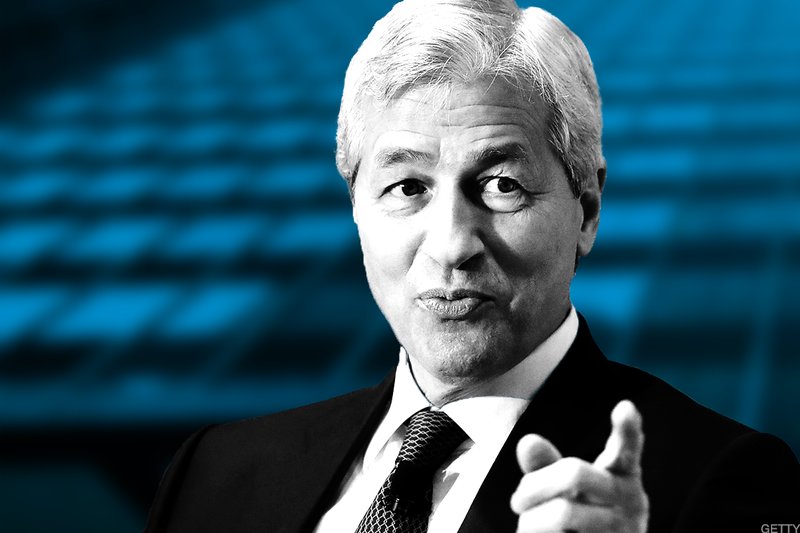 Joe Evangelisti, a JPMorgan spokesman, noted that Dimon has pushed to assure that half of the 10 executives on his seniormost leadership team are women. And by that standard, the bank is well ahead of rivals. At Wells Fargo, women comprise 44% of CEO Tim Sloan's top management team. The percentage is 38% for Bank of America CEO Brian Moynihan, 19% for Morgan Stanley CEO James Gorman, 17% for Citigroup CEO Michael Corbat and a lowest-in-class 14% for Goldman Sachs CEO Lloyd Blankfein. But at JPMorgan, the gender parity stops at the top. As more U.S. companies have pushed in recent years to increase the presence of women on their boards, with a heightened emphasis following last year's #metoo movement, JPMorgan has made zero progress since Dimon took over as the bank's chairman in December 2006. In fact, women's presence on the JPMorgan board has stayed constant since November of that year, when the number of female directors doubled to two under then-Chairman William Harrison. Meanwhile, JPMorgan has allowed at least five elderly, longtime male directors to remain in their seats - despite the belief among some corporate-governance advocates that board members begin to act less independently after more than a decade on the board. They include Lee Raymond, 79, the former CEO of ExxonMobil Corp. (XOM , who has served on the JPMorgan board for 31 years. Dimon, 62, has a reputation as a leader in corporate America, having served on President Donald Trump's now-defunct Strategic and Policy Forum of top executives. Recently he teamed up with Warren Buffett's Berkshire Hathaway Inc. (BRK.A and Jeff Bezos's Amazon.com (AMZN to start a new healthcare company that will attempt to address the industry's challenges. Asked if he was a feminist during an interview in December, Dimon said the answer was yes if the definition was a person who stands up for women's rights. "I'm a humanist," said Dimon, a married father of three grown daughters. "I'm a people-ist." He added that he advises female employees to call out clients for inappropriate behavior, such as touching them on the knee. Aside from the simple principle of fairness, the thesis that a higher percentage of female directors can improve corporate performance is supported by an organization called the 30% Club, of which the CEOs of JPMorgan's two biggest shareholders -- the money managers BlackRock Inc. (BLK and Vanguard Group - are members. Companies with three or more female board directors in at least four of the previous five years reported a 46% higher return on equity, a key measure of profitability, than those with lower representation, according to a 2011 study by Catalyst, a nonprofit organization that advocates for boardroom diversity. So while JPMorgan may be the largest and most successful bank in the U.S., its shareholders may be missing out on even greater returns. Rosenblum, the Pace law professor, said other countries, such as France and the U.K., have developed more rigorous requirements for diversity on corporate boards. There's no similar requirements in the U.S., but JPMorgan's Dimon should shake up its board anyway, he said. It's telling that JPMorgan has so many directors with such long tenures; turnover tends to lead to greater diversity, Rosenblum said. Greater diversity on the board also improves the chances that women will get hired into executive positions, as Dimon says he's sought to do. "One certainly wonders whether that lack of turnover both deprives the firm of fresh insight but also reduces diversity," Rosenblum said. "It's great that he is including women in his leadership positions within the firm, but the board ultimately is in charge of deciding the most important things in the firm, including which CEO to hire." Why Jim Cramer is bullish on Citigroup, Goldman Sachs, JPMorgan and Amazon.